Are you breaking the rules of feng shui without even knowing it? You might be, and if there's any place you don't want to be doing that, it's in the bedroom. Your bedroom should be your sanctuary--your nest--the place you retreat from the world. So, if you're all about that tranquil life, check out the bedroom feng shui pictures below to double check your sanctuary setup. Bed placement is essential to a good nights sleep. Most importantly, the foot of the bed should never be placed in direct alignment with the door. According to Feng Shui, this is known as the "death" or "coffin" position, which suggests your chi will flow straight out of the room while sleeping. If your bedroom ceiling happens to be slanted, then avoid placing your bed under the lower point. Having the ceiling come down will feel literally like stress and pressure coming down on you. But not only that, Feng Shui experts say slanted ceilings cause mental imbalance. Clutter and electronic equipment hinder and decay chi-flow. The best thing is to keep electronics completely out of the bedroom, but another remedy is to cover your television and computer screens with covers or cloth drapes. Pay attention to what kind of art and symbolism you place in your room. Art should be free of ugly or depressing imagery that subconsciously (or consiously) influences your mood and ability to rest. Peaceful art and symbols are best for good bedroom chi. You should also add art that reflects how you’d like to live your life. 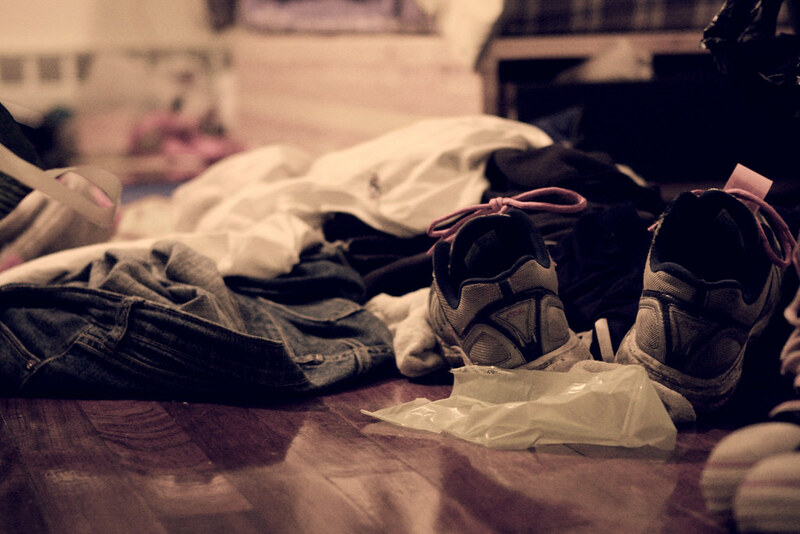 Clothes strewn around the bedroom and on the floors and furniture will create a stressful atmosphere, which is far from relaxing! If hanging clothes up and putting them away each day is unrealistic for you, then at least get a non see-through hamper with a lid where you can keep them out of sight. 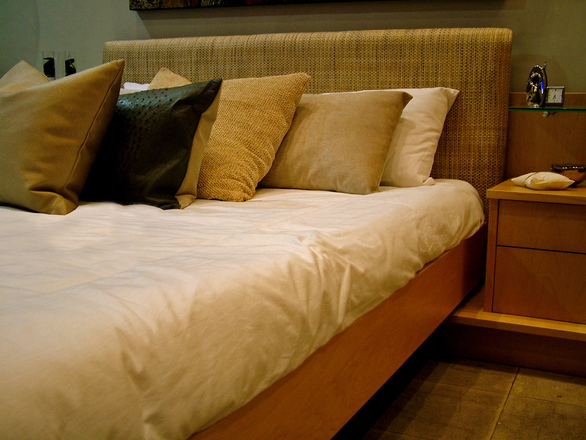 A bed that is easily accessible from both sides allows chi to be unobstructed and flow freely. Feng Shui teaches that the symmetry of having two bedside tables (one on each side) is important for creating a sense of balance and harmony. Having a bed against a wall creates a corner where chi can stagnate, and causes a claustrophobic feeling. 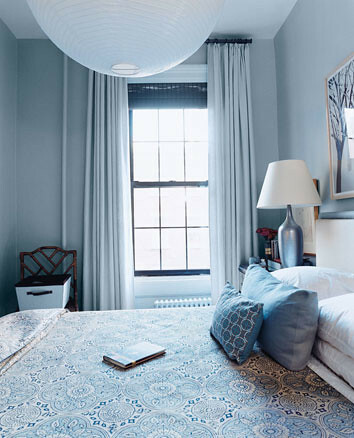 Soothing and comforting colors are the best choice for rooms where sleeping takes places. 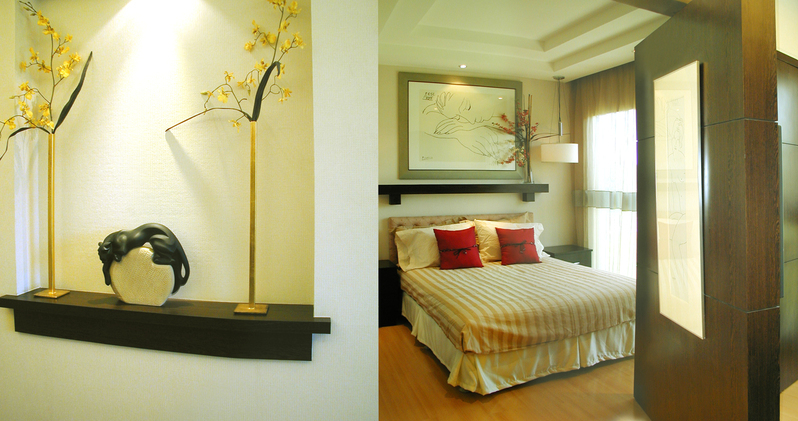 Good Feng Shui colors include neutrals and earth tones such as cream, white, gold, beige, and brown. Never use red (far too stimulating) or anything too vibrant. Soft blues are also good color choices. Usually, mirrors are used as great pieces of enhancing chi when strategically placed, but according to Feng Shui the bedroom is an exception. Placing mirrors across your bed is a big mistake, as mirrors across your bed will cause too much reflecting of the chi making it difficult to rest. It can also cause the illusion of another person in the room in low-lighting, and how creepy would that be? Windows are great because they allow fresh air and oxygen, as well as a great source of natural light. A room without windows will feel like an isolated jail-cell, and the chi is more likely to stagnate. If you do have plenty of windows in your room, just make sure not to place your bed under them, as chi escapes from windows, which will drain your energy while you should be replenishing it. It's also a good idea to keep them covered at night. Having different levels of lighting in your bedroom is great for adjusting it to the time of day or dimming the light in order to induce a relaxed mood. 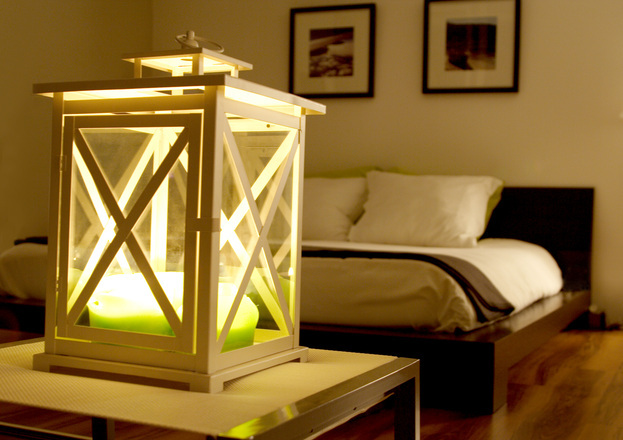 Appropriate lighting is important as light is thought to be a strong energy manifestation. Candles and their soft, natural light are wonderful additions to bedroom for this reason, just make sure not to put them near drapes or leave them unattended! If any room benefits most from a minimalist approach, it's the bedroom, and Feng Shui theory definitely agrees. Numerous trinkets, too much art, or busy wallpaper will be too stimulating and make it hard to get comfortable. Keep your decor simple in the bedroom. 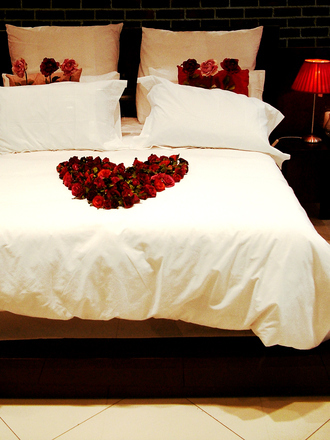 The bedroom often serves as a chamber of love, and intimacy is an important part of being able to sleep soundly. Romantic themes such as figures of doves or lovers do well in bedrooms. You can also add photos of you and your significant other, but not other family photos. In Feng Shui, family photos carry yang energy which isn’t conducive to rest. There’s something in Feng Shui called “sha chi” or poison arrows. These “arrows” of strong, attacking energy tear down your personal energy field, weaking your energy and not promoting health and wellbeing. This occures when any pieces of furniture with sharp edges should not be pointing towards you, and it’s especially bad pointing towards a place of rest (like the bed). Our mothers may have been onto something when they nagged us to make our bed. 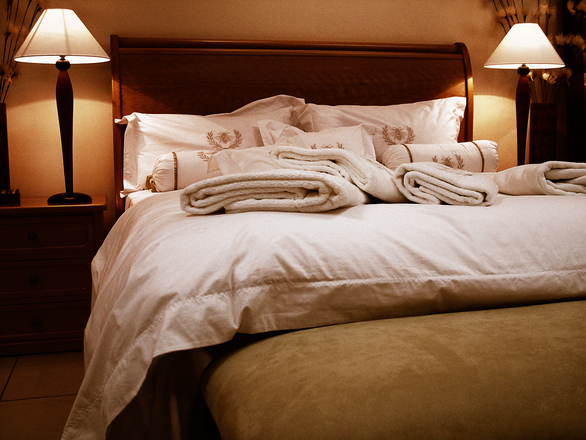 As it turns out, an unmade bed is breaking a big Feng Shui rule. This stagnates and disintegrates chi as well as looks unwelcoming. Make it a habit to do it very first thing each morning. It might seem intuitive not to have spinning blades above your head while you sleep, and if you had that hunch then you're right. 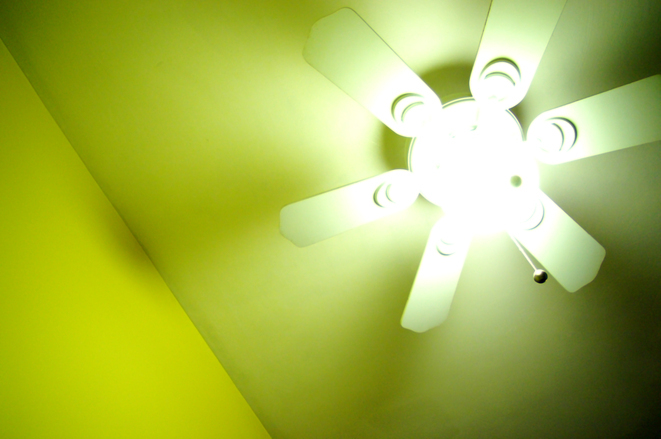 The active "slicing" energy that a ceiling fan creates has no place above your bed at night. Of course, staying up late because you're too hot isn't good for your energy either, but try opting for a different fan placed away from the bed.